These days, everybody's using Bluetooth. Except for audiophiles, that is. They usually shun Bluetooth because it reduces sound quality. Still, there are times—maybe when you just want to liven up (or calm down) a party with some lite jazz tunes stored on your tablet or hear some of the tunes that a friend has stored on her phone—when even an audiophile has to admit it's nice to have Bluetooth. Most of the devices that let you beam Bluetooth from your phone/tablet/computer to your stereo are rather generic, like the Logitech Wireless Speaker Adapter. And audiophiles hate generic. They want something special, something carefully designed and meticulously constructed for the best possible fidelity. 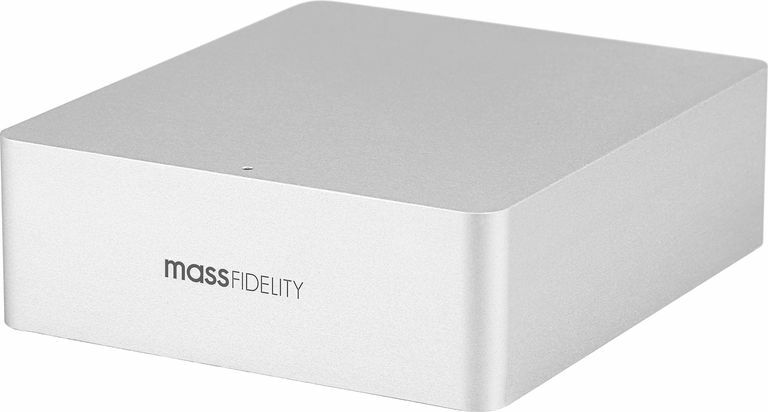 That's just what Mass Fidelity had mind when it created the Relay Bluetooth receiver. The Relay's chassis is small but beautiful, machined from aluminum billet. It looks like a miniature version of a high-end amplifier. Inside, it takes some design cues from high-end audio gear. The digital-to-analog converter is a 24-bit Burr-Brown chip, a brand long revered by audio engineers and enthusiasts. According to Mass Fidelity, the unit keeps the audio signal cleaner by keeping the grounds for the digital audio, analog audio, and radio-frequency circuits. It uses a generic wall-wart power supply, but the manufacturer says the Relay incorporates additional filtering to keep the power clean and noise-free. To evaluate the Relay's sound quality, I played various 256 Mbps MP3 files through the Relay, through my $79 Sony Bluetooth adapter and straight from a computer for a direct, non-Bluetooth connection. For the Relay, I sourced the music from my Samsung Galaxy S III phone, which is equipped with the aptX Bluetooth codec. For the Sony (which is not aptX-equipped), I used an HP laptop as the source. For the direct connection, I played the tunes from a Toshiba laptop through an M-Audio MobilePre USB interface. I was surprised to hear that the difference between the Relay and the Sony was usually as easy to hear as the difference between the Relay and the direct signal. In my listening tests, I often find there's a certain level of fidelity that allows me to relax and just enjoy the music. The direct signal always achieved it, the Relay usually achieved it and the Sony rarely achieved it. One difference was always evident: The Bluetooth devices never delivered the sense of ambiance and "air" that I heard from the direct signal. With the direct signal, recordings made in a large space sounded like they were made in a large space. With Bluetooth, they didn't, no matter if I used the Relay or the Sony. On "Shower the People" from James Taylor's Live at the Beacon Theatre, the treble tones of Taylor's acoustic guitar sounded clean and realistic with the direct signal. Through the Relay, I thought the guitar sounded just a tad buzzy, like maybe there was a piece of paper inside the guitar, softly vibrating along. Through the Sony, it sounded to me like the guitar was made from plastic. On Steely Dan's "Aja," the direct connection easily outperformed the others, giving me a rich, ambient sound. The Relay gave me essentially the same sound, minus the ambiance, with just a little bit of added tizziness on the cymbals. I thought the Sony made it sound like the cymbals had pieces of foil on top of them, rattling in sympathy, and it made the piano sound a little "canned," almost like it was being played in a closet. On Toto's "Rosanna," with the direct connection, the vocals sounded smooth and clear. Through the Relay, they sounded just a tad lispy. Through the Sony, they sounded even more lispy. I could go on, but I'm sure you're getting it. With the high-end Relay interface, you lose the ambiance of a direct connection, and the sound is a tad coarser. With the generic Sony interface, the sound is coarser still, to the point where, for me at least, it became a little grating and often obviously unrefined. One thing I have to point out, though. If your source device is a laptop running iTunes, or an Apple iOS device (iPhone, iPad or iPod touch), you can get an Apple Airport Express or Apple TV for $99 and stream music or Internet radio from your phone, tablet, or computer into your hi-fi system. These devices use Apple's AirPlay wireless technology, which doesn't degrade sound quality the way Bluetooth does, although it does require a WiFi network to operate. Let's return to reality for a moment. We're talking a $249 Bluetooth interface, one that's about six times the price of generic, mass-market solutions. Sure, it sounds better, but does it make sense to add one to your system? That depends on the system. If you're rocking a pair of ordinary speakers plugged into a stereo receiver—say, a speaker/receiver connection costing $800 or less—then the Relay probably doesn't make sense for you. Just get a generic Bluetooth adapter or use a wired connection. But if you're an audio enthusiast with a few thousand bucks invested in your system, and you want the convenience of Bluetooth with the best possible sound quality—and build quality commensurate with high-end audio gear—then yeah, get yourself a Relay.